Whatever you do, don't call Titania Inglis an eco-fashion designer. The 2012 Ecco Domani Fashion Foundation Award recipient prefers the term "thoughtful" by far. 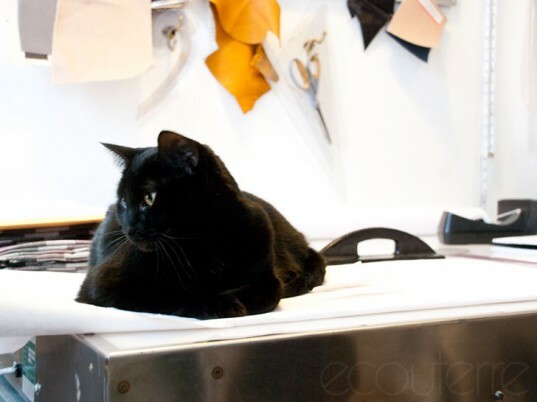 "Honestly, ["eco"] gets thrown around so much that I feel it's lost all meaning," she told Ecouterre during a visit to her Brooklyn studio, where she was preparing her Fall/Winter 2012 collection for its New York Fashion Week debut. "Thoughtful" should just about cover it. Crafted in New York City's Garment District from Japanese organic cotton, vegetable-tanned leather, and deadstock wool, Inglis's eponymous label is as much the result of careful deliberation as it is finely trained instinct, which she honed at Design Academy Eindhoven, the Fashion Institute of Technology, and during stints with Camilla Stærk, Jean Yu, and Threeasfour. I look for designs that are streamlined with a subtle tweak to the proportion, fabric, or construction; the classics can be amazing when done very well, but they can get boring fast. I like it when pieces can be styled in multiple ways. I keep a very small wardrobe, but like to play around with it to create all kinds of different looks depending on my mood. I keep a very small wardrobe, but like to play around with it to create all kinds of different looks. What inspired your Fall/Winter 2012 collection? I was the only girl in my high school who refused to wear a plaid button-down and, since I like to set design challenges for myself, this season I revisited those days and set myself the challenge of creating a plaid button-down that I could love. The collection went from there: a mix of the ’90s layered look from My So-Called Life—a total cultural touchstone for me—with the tough, structured construction of medieval armor and the geometric sea- creature illustrations of Ernst Haeckel. Has anything changed since you won the Ecco Domani Fashion Foundation Award for Sustainable Design in January? My goal is always to find new ways to make each collection sustainable from one season to the next, but the award has given me a lot of new responsibilities this season, namely planning and promoting the show. My hope for the award is that the increased exposure for my line will help inspire more designers to make sustainable choices in their own work. When I was starting out, I was incredibly inspired by Eviana Hartman, who won the first EDFF sustainability award for Bodkin, and I hope to be able to share that excitement with the next generation of young designers. When I was starting out, I was incredibly inspired by Eviana Hartman, who won the first EDFF sustainability award for Bodkin. What got you started on this path to sustainable fashion? I grew up in super-liberal Ithaca, NY, where recycling was mandated by law, and where the waterfalls and woodlands are so spectacular it’s unthinkable not to protect them; so I was an environmentalist long before I became a designer. Even after design school, I had to reconcile myself to the idea of producing more “stuff” to add to the world, but I decided it was possible to run a company in a way that could have a positive impact, and so I launched my line in 2009. What does the term “eco-fashion” mean to you? Honestly, I’m really tired of the phrase “eco-fashion.” It gets thrown around so much that I feel it’s lost all meaning, since some of the enormous mass-market clothing retailers are now creating “eco” collections without changing their overall practices, such as continuing to produce and sell millions of cheap garments that will be sent to the landfill after a few wearings. The phrase “eco-fashion” gets thrown around so much that I feel it’s lost all meaning. I prefer to describe my line as “thoughtful” fashion, in that the company philosophy, the designs, the materials, and the production are all carefully considered as far as their impact on society and on the environment. I’d like to see that as a movement on a larger scale: more thinking. As a designer, you’re constantly making choices that will impact our world in one way or another, and I try to always do business in a way that will ultimately have a positive impact. The woman who wears my clothes should be able to feel good about every aspect: the style, fit, and construction, as well as the production process. Inglis counts among her design heroes Eviana Hartman, who won the first Ecco Domani sustainable-design award in 2009 for her work with Bodkin. "I hope to be able to share that excitement with the next generation of young designers," Inglis tells Ecouterre. Before she was a designer, Inglis was an environmentalist, the result of growing up in "super-liberal Ithaca" in upstate New York. "The waterfalls and woodlands are so spectacular it's unthinkable not to protect them," she says. Inglis cites My So-Called Life as a "total cultural touchstone." The layered look of the '90s, together with medieval armor and Ernst Haeckel's marine illustration inspired her Fall/Winter 2012 collection. Although a lover of classic designs, Inglis admits they can get old fast. "I like it when pieces can be styled in multiple ways," she says. "I keep a very small wardrobe, but like to play around with it to create all kinds of different looks depending on my mood." Winning the award has opened up a wealth of opportunities—and responsibilities. "My goal is always to find new ways to make each collection sustainable from one season to the next," she says, "but the award has given me a lot of new responsibilities this season, namely planning and promoting the show." Inglis says she hopes the increased exposure from the award will inspire more designers to make sustainable choices in their work. Balancing her desire for a small footprint with her output as a designer hasn't always been easy. "Even after design school, I had to reconcile myself to the idea of producing more 'stuff' to add to the world," Inglis says, "but I decided it was possible to run a company in a way that could have a positive impact, and so I launched my line in 2009." As far as labels go, however, "eco-fashion" doesn't have the same cachet for Inglis as it once did. "Honestly, I'm really tired of the phrase," she says. "It gets thrown around so much that I feel it's lost all meaning, since some of the enormous mass-market clothing retailers are now creating 'eco' collections without changing their overall practices." Inglis prefers to think of herself as a "thoughtful" designer, which means she considers the impact her designs, materials, and production has on society and the environment. It's that kind of deliberation that Inglis would like to see on a larger, industry-wide scale. "As a designer, you're constantly making choices that will impact our world in one way or another," she says, "and I try to always do business in a way that will ultimately have a positive impact." The woman who wears Titania Inglis, she adds, should be able to feel good about everything about her garment, from style and fit to construction and production.